Izushi is a historic town among the mountains in Tajima in Hyogo Prefecture. 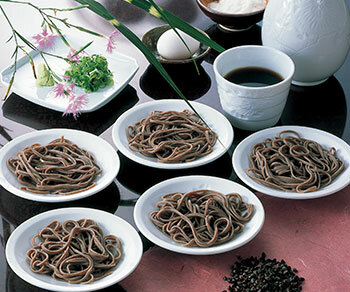 Three hundred years ago, buckwheat noodles (soba) were brought to this town from the home of soba, Shinsyu in Nagano Prefecture. 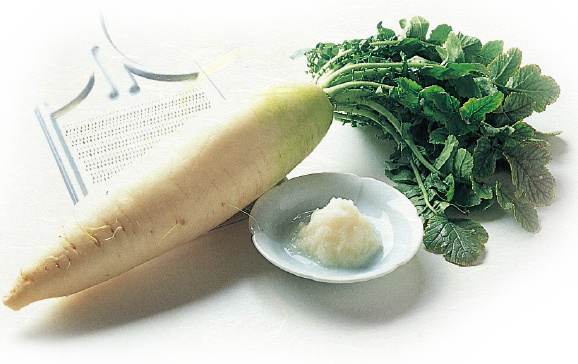 A special dipping sauce, which was influenced by the flavourful broths from the Kansai region, was developed. 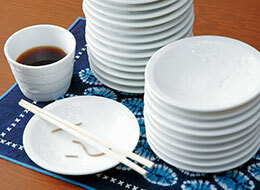 The style of serving the soba also changed to incorporate the use of Izushi pottery plates. 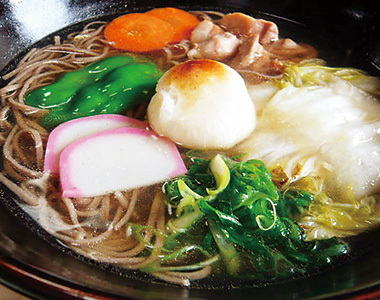 For this reason, it was called “Sara Soba.” Izushi Soba is renowned as one of the most famous soba in the Kansai region. 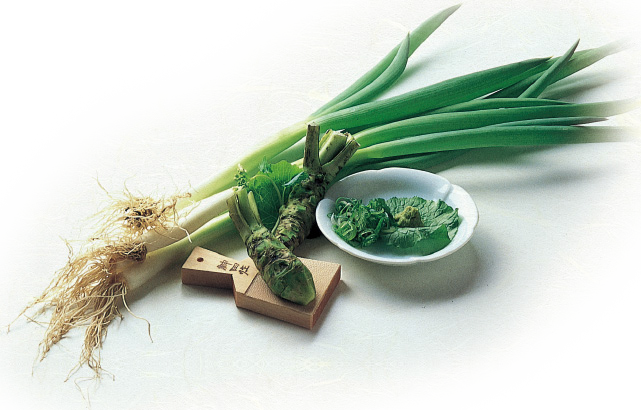 The crisp texture of fresh spring onions and the tingle of wasabi combine to enhance the flavour of the soba noodles. 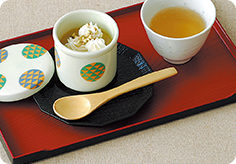 The addition of a freshly beaten egg to the dipping sauce works to harmoniously marry their flavours to the soba. 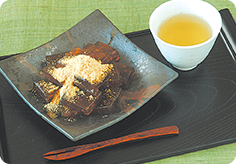 Grated yam brings out the naturally subtle taste of the soba and special dipping sauce. 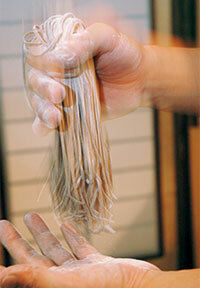 There are three founding principles for making soba by hand. The first principle, “freshly milled” involves using buckwheat flour as soon as it has been ground. The second, “freshly made” means that the ground buckwheat flour must be made into noodles as soon as possible. Finally, “freshly cooked” describes boiling and straining the noodles once they are ready. 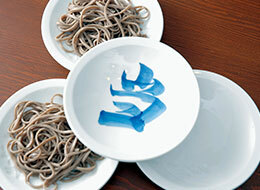 The reason so much attention is paid to time is that soba noodles lose freshness rapidly. The only time a short pause is taken is directly after cutting the noodles. This is because freshly prepared and cut noodles do not sink and therefore cannot be boiled properly. Gentlemen able to eat 20 or more, and ladies able to eat 15 or more, plates of soba will be presented with a commemorative plaquette. Patrons lucky enough to find a marked plate will receive a beautiful gift. Our menu includes hot soba, rice bowls, and a special party menu. Izushi Soba All You Can Eat! Other types are also available. 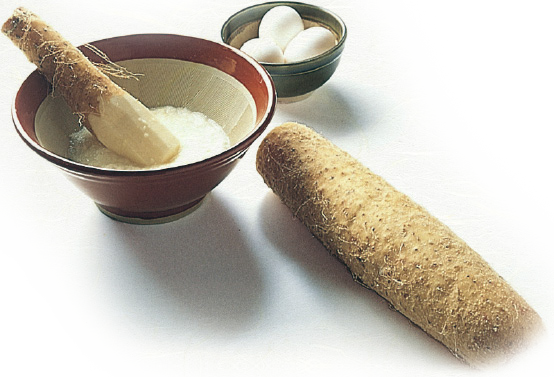 The subtle scent of soba and soybean flour produce a flavour reminiscent of the good old days in Japan. 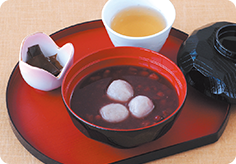 This luxurious dessert comes with three soba dango balls specially made by Sobafuji. They have a pleasantly sweet taste.